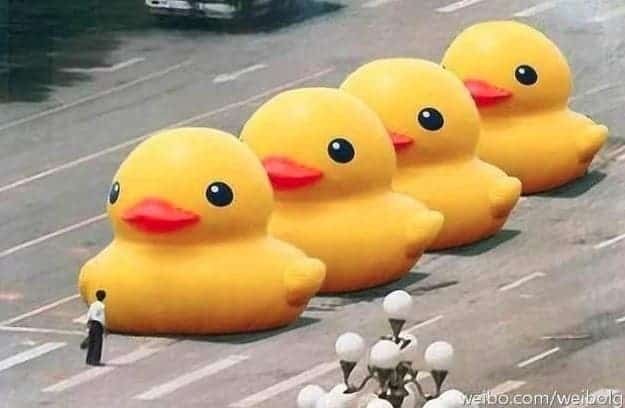 This picture sent ripples throughout the world on June 5, 1989, the morning after the Chinese military violently suppressed the Tiananmen Square protests. 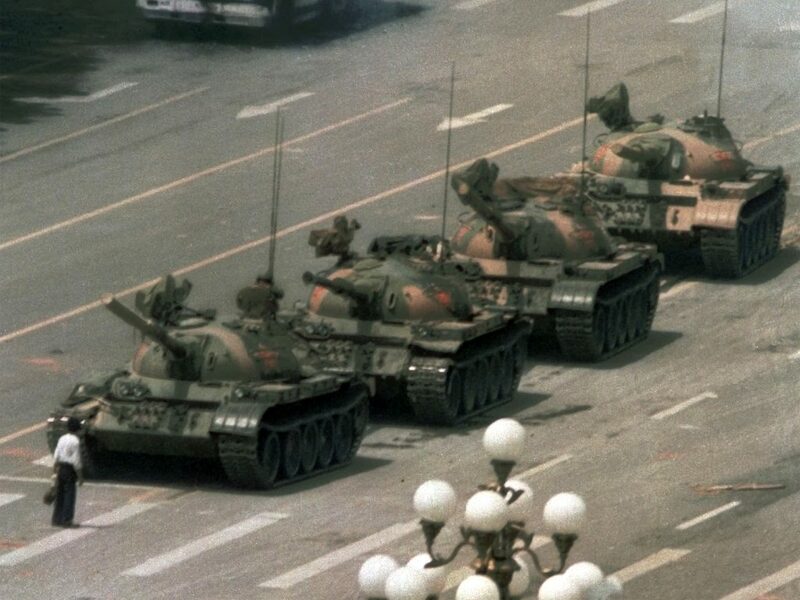 The sheer strength of this photo — one unarmed man, alone and helpless against several tanks — resonated with the entire globe — but not with China’s leaders. Today, after almost three decades, we still don’t know who this man is and what happened to him, and the entire event is massively censored and denied in China. 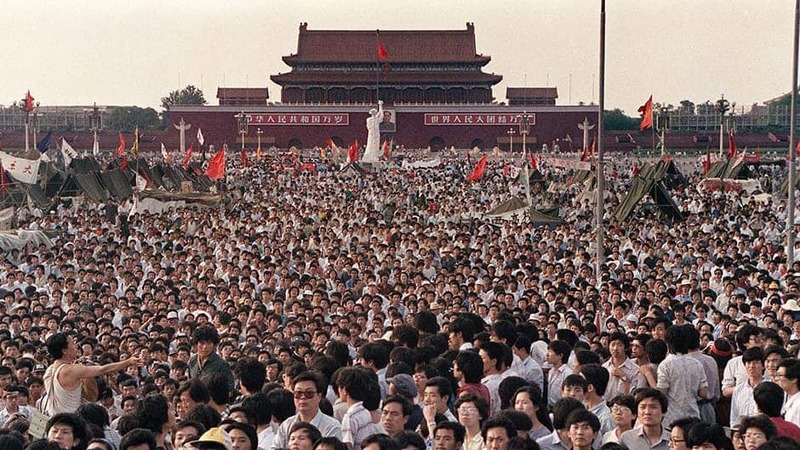 The Tiananmen Square protests of 1989 (commonly known as the June Fourth Incident in China) started as a student movement in Beijing. Students gathered in the Tiananmen Square to mourn former Communist Party General Secretary Hu Yaobang, a liberal reformer. City residents widely supported the movement, exposing the rift between the Chinese leadership and their people. China was passing through a period of massive inflation and several corruption scandals. Protesters demanded freedom of the press, freedom of speech and government accountability — which, ironically, was exactly the opposite of what happened in 1989. Initially, the government took a conciliatory stance toward the protesters, but after the movement spread to other cities, they decided to use massive force. Over 300,000 troops were sent to Beijing, authorized to use force however they deemed necessary to stop the protests. What followed next is generally referred to as the Tiananmen Square Massacre. Troops armed with rifles and tanks opened fire on the protesters, resulting in a dramatic bloodbath. The number of casualties was never properly reported, but it likely ranged in the thousands. That sad day, China’s democracy was squashed under the boots of the military — and that wasn’t even the end of it. Chinese citizens came out in force to stop the army’s entry to the square, but they were fired upon or crushed under the tanks. After the massacre was done and the crowds were dispersed, the authorities carried out mass arrests. Many workers were summarily tried and executed. After imposing martial law, the Chinese authorities blocked satellite transmission to international broadcasters, harassing and expelling all the foreign journalists out of the country. Pictures like these ones are among the few who were taken during the tragic events. What makes this picture even more impressive is that it took place one day after the military crackdown. This man, like everyone there, knew what was happening. He knew that the military was killing civilians, and yet there he was, with his shopping bag, white shirt and black trousers as if it was any other regular day. Because sometimes, you just want to make your point so badly that you stand in front of running tanks. 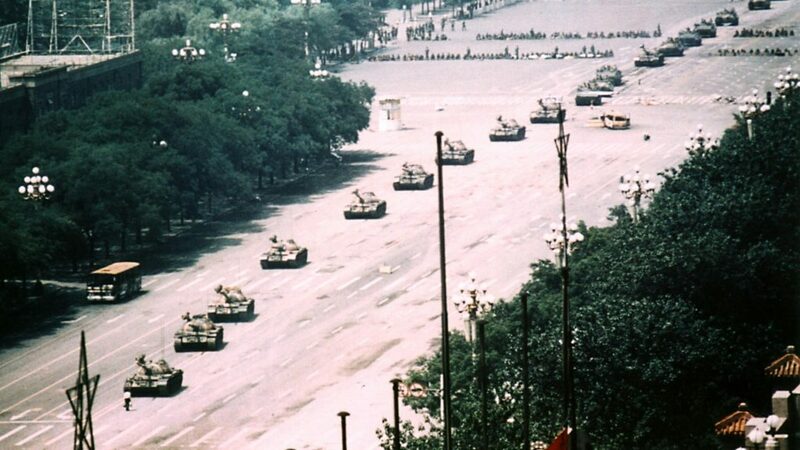 Wider shot by Stuart Franklin showing a column of tanks approaching Tank Man, who is shown near the lower-left corner. According to a book documenting the events, he used his shopping bag to gesture towards the tanks. The tanks attempted to avoid him, but he just blocked their path — time and time again. After repeatedly attempting to go around rather than crush the man, the lead tank stopped its engines. The Tank Man (we still don’t know his identity to this day) climbed on to the first tank and appeared to have a conversation with one of the gunners through the gunner’s hatch. After the conversation, the man descended from the tank and the tanks restarted their engine, but the Tank Man quickly leaped again in front of the tank, resuming their stand-off. Video footage then shows two figures in blue coming in and taking the man into a crowd. We don’t know if the two people were government figures or concerned bystanders. He became an icon in the Western World, symbolizing the fight for democracy and the courage to stand up for what you think is right, regardless of opposition. Sadly, his heroism, and the heroism of the many thousands of protesters is widely unknown in China. Photos like this one on Twitter are mocking China’s censorship. The Tank Man himself might be unaware of these photos. Images of the protest on the Internet have been censored in China. When students at the Beijing University, where all the protests started, were shown copies of the iconic photograph 16 years afterward, they “were genuinely mystified.” Some of them believed the images to be fake. Sina Weibo, the country’s most popular Twitter-like social media platform bans searches about this incident or simply redirects them to other “harmless” events. A quarter-century ago, a movement for peace, freedom, and democracy was brutally squashed. A quarter-century ago, a man took his shopping bag and stood in front of moving tanks, to defend what he believed in. We don’t know who he was or what happened to him, but we do know what he stood up for. His courage and effort were not in vain. This image moved the world, and with all its impact, it should have moved China — but, unfortunately, it hasn’t.